Beet lovers, this Pickled Beet & Egg Salad On Avocado Toast will have your taste buds doing a happy dance. I'm not sure why it took me so long to combine pickled beets in a salad with eggs since growing up in Russia, there were multiple dishes in which roasted beets were combined with hard boiled eggs and mayonnaise. The taste was great, the vibrant color was even better. If you think beets taste like dirt, you need to reconsider. Roast a few beets or buy them pickled in a jar and give them another chance. My twin has posted several photos of hard boiled eggs pickled in the liquid from pickled beets and turned them into a salad. I decided to go one step further and add pickled beets into the salad! First, you cook the eggs as you normally do. For me, that means covering eggs with cold water in a small pot, bringing it to a boil, turning the heat off, and letting the eggs sit covered in the pot for 10 minutes. 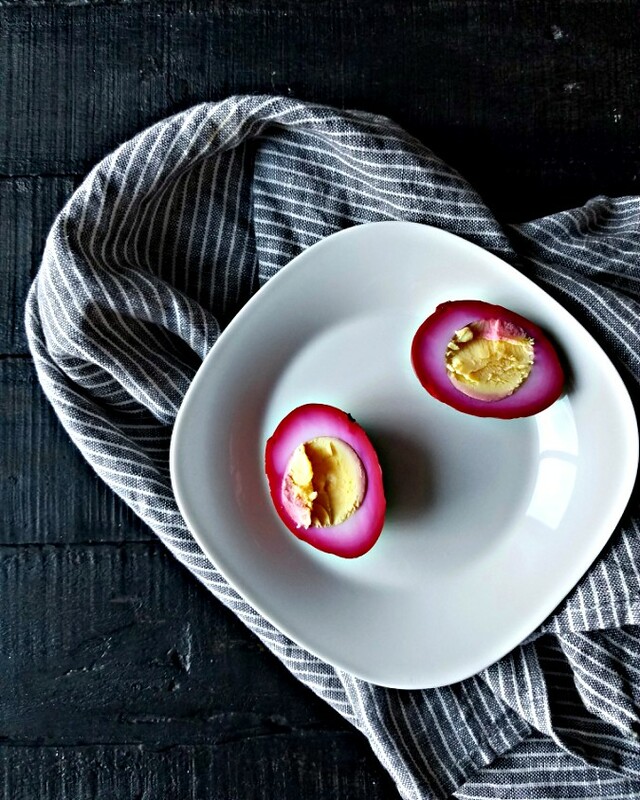 Cool, peel, and dunk into the liquid from pickled beets. Refrigerate. I found the texture of the eggs change quite a bit and become firmer and almost unpleasant. The color was gorgeous, but even after several days in the pickling liquid, the flavor didn't really permeate the egg. Instead, I suggest you use regular hard boiled eggs, and then add pickled beets. You'll get the same great color, but better texture. 1. Combine chopped eggs and beets with mayonnaise. 2. 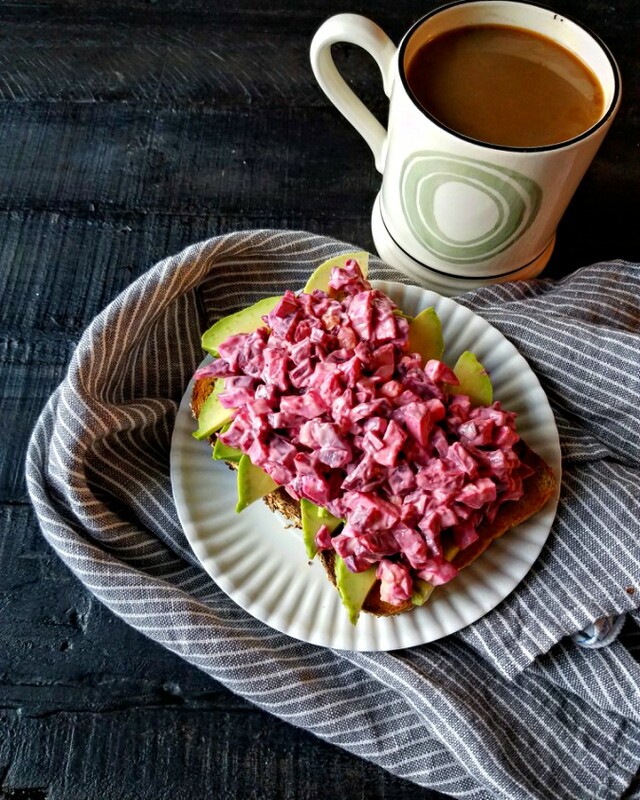 Top the toast with sliced avocado and beet/egg salad. 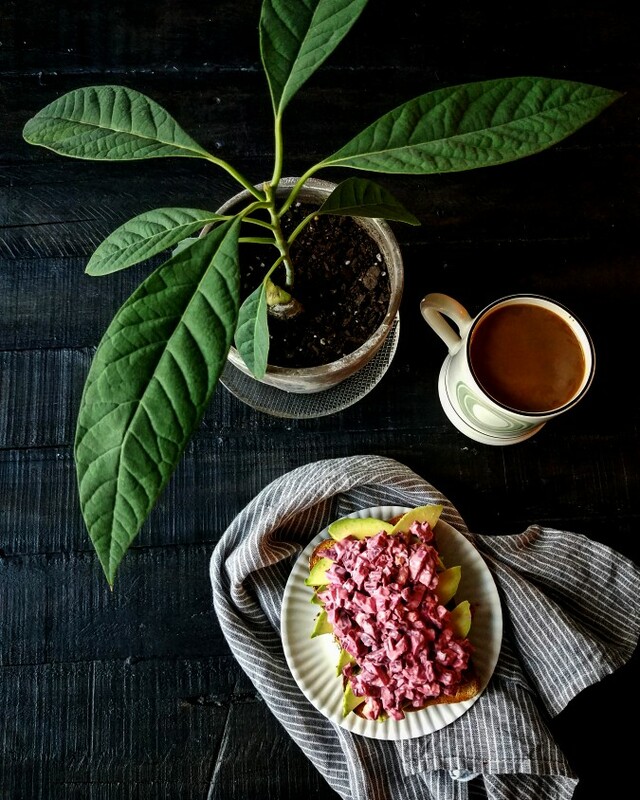 By the way, the very first photograph in this post shows my avocado tree!! How pretty is it? Have you tried growing one? It's a super long process which has tested my patience several times. The tree will never produce actual fruit, but I love the green leaves!